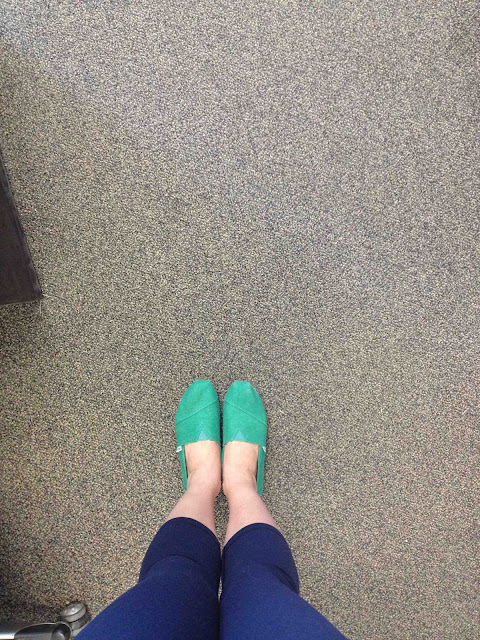 Trudy Talk: Weekend Shenanigans: TOMS, cookies, and babies! Oh right...blooooooggg. It hasn't been that long, has it? Pretty well a week, not so bad! Did you have a splendid weekend? Here's what Scott and I have been up to . . .
. . . hanging out with the Ben and Frances! It was a gorgeous day on Saturday and we played outside for a little bit, walked for some ice cream and made some dinner. PLUS there was watermelon, which is always awesome ;).
. . . made some cookies! 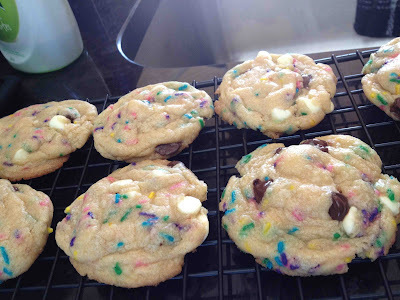 Cake Batter Chocolate Chip Cookies from Sally was what I chose...and they were pretty scrumptious! I followed her recipe fairly exactly, I just added a few less chocolate chips and sprinkles because I thought they looked alright! They were so soft and fluffy and disappeared far too quick! Guess I should've made a double batch!
. . . we saw a couple of movies. On Friday night, we saw Oblivion which was pretty good. It was kind of an interesting movie with a few unexpected twists...I liked it! I'd probably give it ***.5(3.5)/5 stars. I'd recommend it for those interested in sci-fi/futuristic-y type movies. Last night, we saw Iron Man 3 which I'd also say is just pretty good. Robert Downey Jr. is a very enjoyable actor (in my opinion). It was well done and I enjoyed it but I didn't walk away thinking - WOW, that was awesome! Overall a good continuing of the story. But I'd still definitely recommend if you're interested in those movies. (PS, if you DO go see it, there's a clip at the end of the credits...but I personally don't think the clip was worth waiting through all the credits for). I'd also give this movie a ***.5(3.5)/5 stars. It looks like there's some good movies coming out soon though! That's my weekend for the most part! What's your most exciting event? Have you seen Oblivion or Iron Man 3? Baha, Joe saw Oblivion and he HATED it. I wasn't surprised because it has Tom Cruise and I'm not a fan of Tom Cruise, lol. And we saw Ironman 3 too! I wasn't too stoked to see it initially, but it was a lot better than I was expecting. I just really like the fact that Pepper got to do some cool stuff in this one. And I like the looks of those cookies! I will definitely have to give them a try one day! They're tasty! Definitely do it! OMG -- cake batter chocolate chip cookies?!?!? Say it ain't so. Max's favorite food EVER is anything cake batter... I MUST make these. MUST. And hey, that's alright! Movies are insanely expensive! I need to try those cookies! Stat! Thanks for posting the recipe!!! You sure do! Hope you like them!